I cannot begin to tell you how stoked I am for this release! 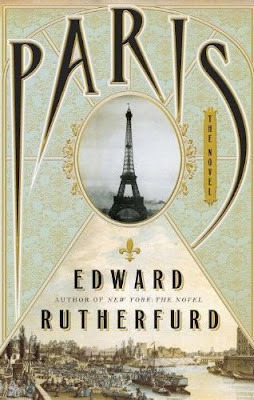 The Novel, Edward Rutherfurd brings to life the most magical city in the world: Paris. This breathtaking multigenerational saga takes readers on a journey through thousands of years of glorious Parisian history. Oooooh, I've read all of his books. I read Edward Rutherford's novel, "London" and I'm am especially excited about reading "Paris" not only because I know how well Mr. Rutherford writes, but because Paris was home to my family and me for many years. While living there, I became totally enthralled with the history of the city itself, as well as the churches and buildings. My husband and I spent nearly every Sunday visiting and touring churches and chateaux. Paris is the most amazing city anywhere and totally deserving of its praise and fascination. I love Edward Rutherfurd's books. Can't wait to read this one! I've read Rutherfurd's Paris and loved it. I have wanted to read London but haven't gotten to it yet. I know that I will be adding Paris to my TBR as well. He's such a fascinating writer.